Learn to create a stunning 3D Target with this video Tutorial. Use a base venn diagram and makeover the smartart graphic. This video uses PowerPoint 2013. 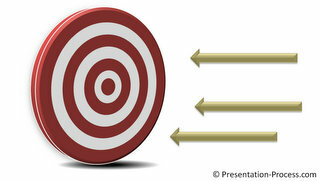 The graphic is useful for representing business concepts like sales targets, steps to achieve goal, issues in achieving goals, target setting and so on. If you liked this tutorial and would like to learn more, please browse through this site. You will find over 250 PowerPoint tutorials and creative ideas for presentations. Thanks you for watching the video and happy presenting!